Dear Elle Mag, I can do that! Not sure if this happens to everyone, but one of my favorite things about thumbing through my latest fashion mag are the sartorial ideas that come pouring out of my melon! I am in a constant state of flipping through my closet rolodex – trying to locate some old thing, combining it with another old thing, in hopes of creating a new thing. Thus resulting in the inevitable compliment in which I respond with “this old thing!?! oh stop!”. 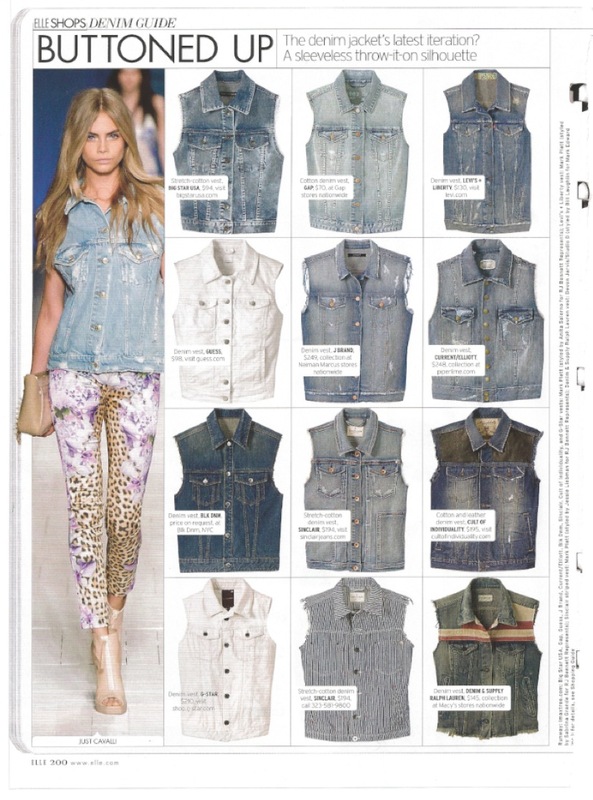 This very process played out the other day when I spotted this page in Elle showing that by buttoning up your denim vest to make it more of a solo item rather than a layering piece, you can give it a modern make-over! I grabbed my cropped version, which I purchased from Rampage in 2004 (not kidding) and paired it with my fitted tribal maxi for a casual lunch date. Please excuse my amateur selfie. We are getting profesh cameras soon promise!